Me personally, after crossing the Israeli - Egyptian border in January 2011, I was taken directly to Saharonim prison in the Negev. Four days later, with a group of about forty Sudanese and Eritreans we were taken from inside prison to the administration offices outside, at around 7:00 Am, to be interviewed. Waiting for the interviewers who came two hours late, we were all locked in a cage where there was only a toilet, a sink and two sofas. And a police man was standing by the door. The police man called us one by one to go to next door for the interview, locking the door behind each person. When it was my turn, I entered into a normal office, four by four meters, and I saw two desks: one on my left with an interviewer, a translator and an Eritrean. And on my right another one behind which someone was sitting. I said ‘’hi’’ to him and set down on the empty chair. So, without presenting himself and without knowing why he wants to investigate with me, he started by some typical questions about me and my family: name, age, marital status, children, profession…. Etc. One of these questions was about my educational level. So, I told him my entire story from primary school, to a bachelor in French language and to doing only one year of Master degree, but not getting a chance to finish it. Then, when he knew that I lived in Khartoum, he asked me about the name of some places in that city. And I was surprised when he asked me: ‘’ How many bridges are there in Khartoum?’’ A silly question to be asked in such interview, I thought. It was like in a serious meeting you ask an American: ‘’ How many streets are there in New York City?’’ And I was wondering why it is important for the authority to know the number of bridges in Khartoum! As I tried not to tell him directly that this is a stupid question, I told him: ‘’ listen! It’s not a question of bridges or stadiums; it’s a question of …’’. But he interrupted me shouting in his Israeli way: ‘’Me, I ask and you are not allowed to talk. You give answers, do you understand?’’ “yes I do”, I said. So he repeated his question. There are four bridges in Khartoum, I answered. And he wrote down my full and correct answer. And when that intelligent interviewer remembered that I can speak French he said: ‘’ Sudan was colonized by the British. And people speak only English and Arabic, there. So why do you speak French?’’ And it took me time to explain to that baldhead interviewer that in Sudan there are universities, French alliances, and a French cultural Center. So, people learn. And it isn’t strange to see a Chinese person speaking Arabic. ​Twenty minutes of interview during which I thought I was talking with the wrong person. Also, it was hard to speak about useless issue ‘’ bridges’’ in a non-respectable way. So, after finishing my interview, the policeman put me again into the cage until all people did their turn. Then, we were taken to another office and given letter written in Hebrew without understanding what was it for. At that place, I told a police woman that we didn’t eat or get something to drink since we were brought here. So, she went inside her office, and came back with some bread saying: ‘’ I’m sorry! That’s all I have’’. And we were taken back again inside prison, at around 14:00. 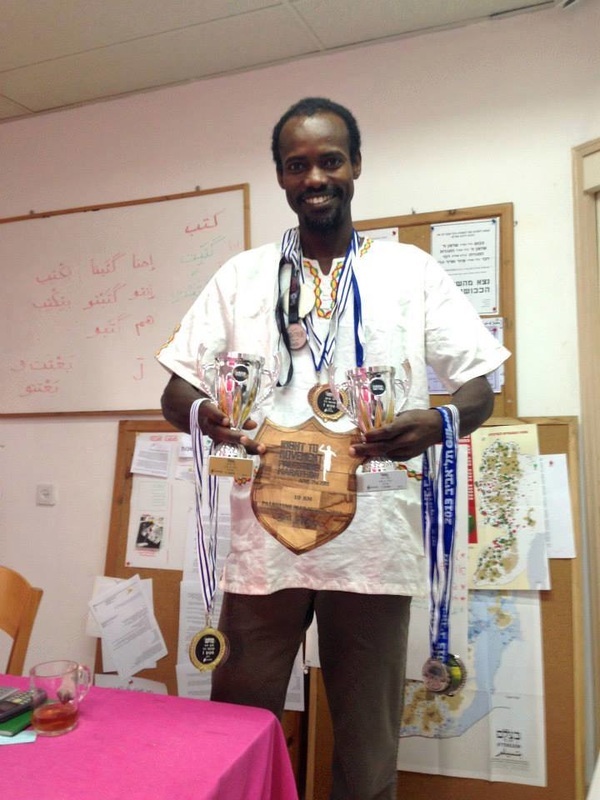 “In Sudan, I started my running exercises when I was a student at university with a coach. But here in Israel, after working very hard in building and joining an English class in the evening, I didn't have enough free time and energy to go running. One day I was very angry and down because I was accused of stealing a necklace from an empty room that I was asked to clean. Then, after a long conversation with the security team of the Hotel, they told me that they put it there themselves because they wanted to check if I’m a honest person or not. For me, this way of treating people was done in Babylon centuries ago, when people didn't know who they are. So, after finishing my work, I went out of the hotel and, around 4 PM, I started to run back home. After that, I kept on training once or twice a week, and have competed in many races. Running is my favorite sport that helps me to relax, feel good and listen to myself. How do people in Sudan refer to their politicians? In Sudan, people do have domestic animals. And donkey is one of these animals that farmers like to have; because it helps them carrying heavy things from one place to another. Somehow, the word (donkey) entered into the Sudanese daily expressions. Of course, not to call that animal to come, but to describe a human's behavior: the stupid one. In those expressions, the meaning of donkey depends on the context in which it's used. However, if you saw a person behaving in a very stupid way and you used this word to describe his/her attitude, he/she won't be happy with you. In that part of the globe, there is a common saying that people like to use to make fun of some politicians: '' the old man's donkey has stopped while climbing up the hill ''. Here, the word "donkey" is a metaphor to describe politicians who always call themselves smart. But at the same time, they don't see that they keep making mistakes. And by their short vision, when things get into a delicate situation, they try again to find others solutions. So, when Sudanese travel to another country where politicians react in the same way, should they use the saying above in that context? Well! There’s no limit for people to express themselves. But, people who didn't get yet to evaluate their own behavior should be given more chances to develop. I think. For example, since 2005 many Sudanese people crossed the Egyptian borders and got into Israel seeking asylum, they said. Once they arrived, they had to stay in prisons for a period of time according to the Israeli law of borders and infiltration. But what is remarkable here is not all of those infiltrators spent the same period of time in prisons: at first, it was a whole year. Then, it became 9 months. But also, it was changed to 6 months. And it went down to 3 months. Until, it reached 21 days. At the end, they were released without listening to their stories, because the Israeli authority meant not to hear anything and considered them as illegal-migrants. After living inside the country for several years, the Israeli government spent 323,000,000 NIS building a detention center in the Negev, called Holot, in order to put them, despite the Israeli high Supreme Court’s decision of considering it as an illegal act. At first, the Israeli ministry of interior found it a good project and decided to put them there for 18 months. But, when it realized that it’ll cost over 25,000 Shekels per person a year; it gradually changed this period to one year. Right now, it became 9 months. And maybe, it will be 6 or 3 months, in the near future. And once they are released from Holot, they are given again the same kind of renewable visa and asked to go to all cities except Tel-Aviv and Eilat. This doesn’t make sense. Actually, from the beginning, when those Africans asked for Asylum forms, the authority refused to give it. And now, it wants to study individual’s cases although it doesn’t know how to interview people: what questions to ask, and others circumstances that should be considered during the interview. But how come the authority, who tried many times to use its policy to press them and who helped on creating a gap between them and the citizens; wants to interview these Asylum seekers? Would they trust the people to whom they are talking at the interview? When first those Africans stepped on the Jewish holy land, they were sent to jail for their illegal arrival. Then they were released and have been living inside Israel for long years. Again they were found illegal staying in Israel and were taken to Holot. And they are released again to live wherever they want except Tel-Aviv and Eilat. Now, Israeli government understood that ''Holot'' was not a good decision. This project takes a lot of money and it can't handle it much longer. And at the same time it wants to keep it opened, in order not to show its mistakes. So, Sudanese people who have been living in Israel for many years, and who found the decisions that are taken against them are not logical, why shouldn’t they use this expression to describe those "intelligent" politicians who made those wrong decisions?